Finding foods that satisfy a 4pm slump or a craving for dessert after dinner that aren’t really bad for you can be hard. Feeding children something healthy and filling, when they seem to be constantly hungry can also be a battle. 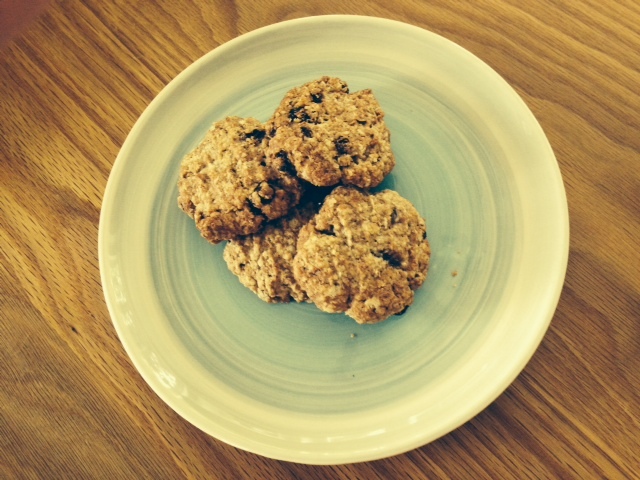 The key when feeding children (and adults) is to include wholegrain carbs alongside the sweet stuff. If you have the time at the weekend, baking biscuits or a crumble can be a great activity with kids and gives you a supply of snacks or pudding that can be included in lunchboxes or eaten at home. Fruit tastes fantastic when it’s baked and you add a lot less sugar when cooking yourself. In the bowl of an electric mixer, cream the butter until soft. Beat in the sugar until light and fluffy. Add the vanilla, milk and eggs and beat thoroughly. Add the flour with the cinnamon, salt, baking powder and bicarb of soda and mix until just combined. Stir in the oats and sultanas. Place the bowl containing the batter in the fridge until firm, for a few hours or overnight. Preheat oven to 180deg. Grease or line two baking trays with greaseproof paper. Scoop out tablespoons of the batter, shape each into balls and arrange on the prepared trays, a few centimetres apart. Press down with a wet fork to flatten slightly. Bake until golden, about 15-20 minutes. They should still be slightly soft in the centre. Remove from the oven and transfer to a wire rack to cool completely. Store in an airtight container. These cookies would be fantastic as an afternoon snack, accompanied by an Australian style smoothie. Simply chop a banana and add a handful of strawberries or blueberries to a blender, together with 150ml milk and a spoonful of vanilla yoghurt. This combination would supply 1 of your 5 a day fruit and veg, 1 of your 2 required servings of calcium, B vitamins for energy, protein and fibre. To make the crumble, combine the flour, sugar and ground nuts in a bowl. If you have a bag of mixed nuts, grind them with a pestle or mortar or place in a freezer bag and use a rolling pin to smash them into small pieces. Add the butter cubes and rub in using the tips of your thumbs and middle fingers. The mixture should end up looking like breadcrumbs. Peel and slice the apples (or pears) and place, together with the berries in an oven dish. Add 1 tbsp water to help the apple cook. 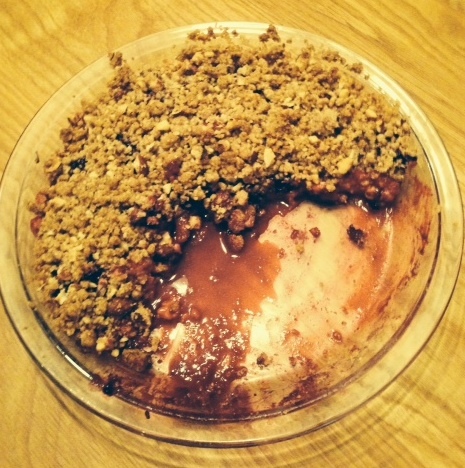 Sprinkle the crumble mix evenly over the top, ensuring all the fruit is covered. Bake in the oven for approx 25-30 minutes, or until the crumble is brown and the fruit is bubbling. Serve with a scoop of vanilla yoghurt or for a special treat, a dollop of cream. This recipe also supplies 1 of your 5 a day, together with protein, fibre and B vitamins from the crumble topping for slow-release energy.